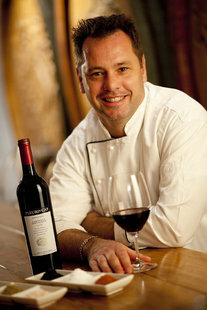 Salt aficionado Chef Craig Cormack, known for his exceptional dinners with salts from around the world, has created oriental-inspired dishes for his next pairing menu in Die Bergkelder, the famous ‘cellar in the mountain’ in Stellenbosch, on Thursday, 25 August 2011. The latest in a series of salt and wine pairing dinners held in Die Bergkelder on the last Thursday of every month offers guests a range of oriental dishes from sushi to lemongrass ice cream, all showcasing the versatility of Fleur du Cap’s elegant Unfiltered wines. Currently chef patron at Sofia’s restaurant in Somerset West, Craig has been pairing wine and salt for the last 4½ years and has an impressive collection of rare salts from around the globe. To whet your appetite, Craig will kick off his 4-course salt and wine pairing menu with a salmon sandwich paired with Fleur du Cap Unfiltered Sauvignon Blanc, followed by an Asian pork stir fry doused with Fleur du Cap Unfiltered Merlot. For Fleur du Cap’s award winning white blend, Sauvignon Blanc / Chardonnay / Semillon / Viognier, he will be serving salt crusted linefish as a main course. To bring the meal to a decadent close, Fleur du Cap’s Platter 5-star Noble Late Harvest will add the finishing touches to a salt infused chocolate tart tempered with lemongrass ice cream. Cut deep into the slopes of the Papegaaiberg, Die Bergkelder, the home of Fleur du Cap wines, offers one of the finest wine experiences in Stellenbosch. The tranquility of the vaulted spaces of this bottle maturation cellar founded in 1968, offers the perfect atmosphere for memorable dinners. The 4-course Fleur du Cap Unfiltered Wine and Salt pairing dinners costs R400 per person including the tasting, food and wines and begin with canapés at 19h00. Booking is essential as seats are limited. Call Nadia Ferreira at Die Bergkelder on Tel: 021-809 8025 or email info@fleurducap.co.za. For more information on Die Bergkelder and Fleur du Cap Unfiltered wines visit http://www.fleurducap.co.za. This grape variety has a recent history – of less than 600years to be precise. Sauvignon grapes seem to have been first mentioned during the 18th century when one Baron De Brane is said to have planted a red wine grape called Vidure, French for ‘hardy vine.’ A popular vine that is grown in Australia, statistics tell us that in 2001 more than 28,000 hectares of Cabernet Sauvignon vines were planted there. Interestingly, whilst unripe Cabernet Sauvignon grapes produce a ‘grassy’ flavoured wine, ripe grapes of this variety yield a rich, ripe flavour. One of the best known of Italian wines, it is a very old wine with a history stretching back before the 15th century, when Chianti is actually referred to as a white wine. The main type of grape in Chianti is the Sangiovese, but it may also contain Cabernet Sauvignon grapes too. Chianti wines are considered to be among the best to be produced in Italy. It is described as being a luscious wine due to its rich berry fruitiness. Merlot grapes can be traced back to 1st century France. They are difficult to cultivate due largely to their being susceptible to early frosts. They are disadvantaged by their largeness and their thin skins, both of which makes them tempting targets for birds. However, this variety can thrive in cool climates and poor soil. The main French region for growing the Merlot variety is Bordeaux, and in similarity to Sauvignon Blanc grapes, Merlot is also successfully grown in north east italy. This grape variety has a long history indeed since it dates back to the Romans and is affiliated to the noble Pinot family. It has religious connections in that it was used by Catholic monks in their sacraments. Thanks to the planting and replanting by these monks, Europe was enabled to develop specific varieties of grapes (and hence) wines to a particular region. By the 6th century barrels of Pinot Noir were being exported to the Pope. However, the French Revolution of 1789 proved a troublesome time and instead of landowners leaving plots of their land to monasteries of their choice, as had been the custom, vineyards were now seized and secularised and were given to the surviving members of the Pinot family to be managed independently. Predominantly grown in France, Pinot Noir has a rich full bodied flavour which compliments its soft, velvety texture. It is neither acidic nor tannic. Believed to have originated from Tuscany in 1722, it is where the majority of Sangiovese grapes are still grown today. They are also grown successfully in California where the climate resembles Tuscany. From the 1890s onwards, this variety was used in the production of Chianti wine. Fourteen separate and distinctive clones of Sangiovese have been identified. A variety that produces abundant fruit, its first appearance was in the USA in the 1830s. By the 1860s it was being produced in Californian wineries and has been defined as being one of the oldest wine varietals in California. It is difficult to cultivate due to its tendency to ripen unevenly. The first variety of grape to be cultivated in unknown. However, with regards to wine making it is the Egyptians who left a detailed legacy of how wine was produced. This they did through their tomb paintings. Grapes were harvested with a curved knife and gathered in wicker baskets. From there they were placed in vats of acacia wood and trodden on. The Greeks most likely learnt their viticulture from the Babylonians, whilst the Romans improvised on Greek knowledge and techniques. The Romans chose Marseilles as their base and from here established the major wine producing regions of France. The Romans also developed the vineyards of the Rhine and Mosel in Germany. Regarding Bordeaux wines, at the beginning of the 2nd millennium, ‘claret’ was being shipped to England from the Bordeaux region. By the 14th century, half of the wine produced in this region was sent to England in ships. During the 17th and 18th centuries, the majority of wine produced in the Bordeaux region was controlled by merchants from England, the Netherlands and Germany. In 1855 these merchants ranked these distinguished Bordeaux wines as Grands Crusclanes, a classification that still exists today. A wine decanter is a glass vessel which is used to hold and serve wine. When you decant wine something magical happens. You turn a pedestrian thing in a showpiece, an elegant presentation of wine. But decanting wine is not all just about appearances, it can also cause a magical transformation in the wine as well, helping to optimize your experience of a fine wine. 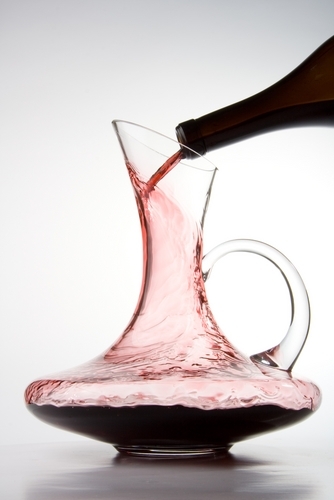 When learning how to serve wine, a wine decanter can help bring you into the big leagues of fine wine presentation. There are three primary uses for a wine decanter which will be listed below. There is a great deal of controversy amongst wine enthusiasts about which wines should be decanted and for how long they should be decanted prior to serving. While there are no absolute rules for decanting wine, there are some general considerations to consider. Presentation – There is something very elegant and beautiful about a wine being served in a pretty decanter. It serves to highlight the wine and let your guests know that they are in for something special. Both red and white wines look beautiful in a clear, crystal wine decanter. While this is a purely aesthetic reason to decant a wine, it does aid in the presentation of fine wines and, besides, enjoying fine wine is an aesthetic pastime anyway, is it not? Aeration – The act of decanting a wine exposes the wine to oxygen in the air. 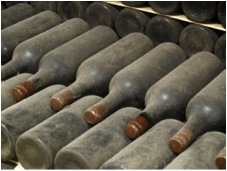 In the bottle, the wine in its long rest has been largely devoid of oxygen exposure (except for the small amount inside the bottle and the miniscule amount that diffuses through the cork). Oxygen can cause dramatic changes in a wine and when a wine first breaths its first breaths after its long sleep amazing things can happen. Just the act of pouring the wine into the decanter exposes the wine to air but most decanters also increase this aeration of the wine by providing a large surface area of wine to air contact to allow the wine to continue to absorb and react with air. While long term exposure to air can lead to oxidation which is not usually desirable, in the short term it can do wondrous things for some wines. Removing Sediment – Most people agree that wines that are excessively filtered by the producer prior to bottling loose much of their depth and complexity. Therefore, most fine wines are not filtered or only lightly so. These wines tend to throw a sediment, a solid that precipitates in the bottle, particularly with aging. This is a perfectly normal thing and actually a sign that the wine is alive and natural and hasn’t been excessively filtered.